While there are plenty of cases available to protect your iPod or iPhone from bumps and drops, precious few allow you to use said gadgets underwater—especially if you own a new iPod nano or shuffle. 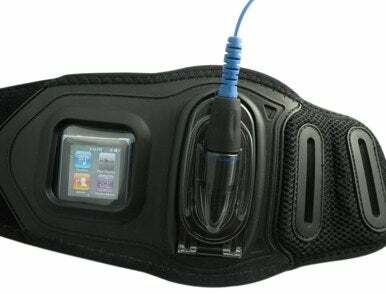 Coming to the rescue is H2O Audio and its new Amphibx GRIP armband, which lets you rock and wade with the new 6th generation iPod nano and 2nd, 3rd, and 4th generation iPod shuffle. The Amphibx GRIP wraps around your arm like a regular sports band and offers full access to your iPod's controls while in or around water. Designed for swimmers and water sports athletes, the armband protects your iPod in a 100 percent watertight seal that provides waterproofing up to 12 feet. You control your iPod through a clear window that lets you operate the touch screen and button controls while keeping your device dry. Thanks to a patented "SealTight Connector," the Amphibx GRIP is fully compatible with standard headphone plugs, though you'd be advised to purchase a pair of waterproof headphones if you plan on listening to music near or in water. The Amphibx GRIP retails for $60 and is available now at H2O Audio and various other retailers.